It seems that it took me forever to get my 11 yos to read a book without pictures. I sort of bribed him. I told him he had to read two novels without pictures and I would get him his Ripstick. My husband suggested Summer of the Monkeys. My son absolutely loved the book. He would give us a play by play of it. There is also a movie too, but he has not seen that yet, but now he wants to. He has also read a book called Darkside, and he just finished Ever. I am so proud of him for reading these novels. 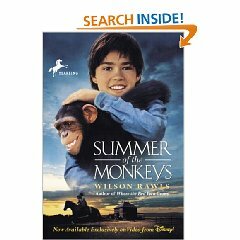 We read Summer of the Monkeys and laughed so much imagining it all. My son then wanted to view the movie and what a disappointment. Will be interested in what you think.